Figure 4.10. 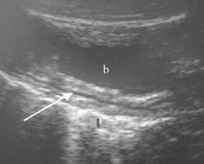 Ultrasound image obtained with an abdominal transducer of the bladder (b) and uterus showing a hypoechoic line representing uterine fluid (arrow). This 6.5-year-old female (SB 404) had a purulent cervicitis, which was presumed to be related to endometritis. She was treated with injectable antibiotics and successfully conceived shortly after this image was taken. were weighed, measured and subjected to a thorough and systematic biomedical examination. From this effort, we generated substantial data on animals that appeared 'normal' versus those with various medical and developmental challenges. No significant problems were encountered using the anaesthetic regimens described. Ketamine HCl alone was safe and effective for such short-term evaluative procedures. 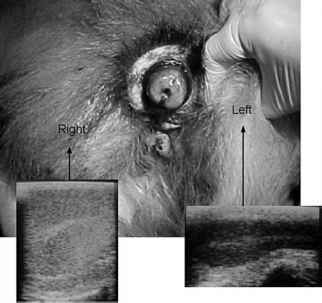 Standard monitoring techniques (including pulse oximetry, ultrasound and laparoscopy) proved useful and effective. There was a significant prevalence of abdominal effusions, and severe ascites was detected in three individuals. Fractured canine teeth with pulp exposures were observed in 16% of the population with excessive tooth wear for age observed in another 15%. Mild hair loss on the eyelid border attributed to Demodex sp. mites was seen in five animals with one additional individual experiencing severe demodecosis with extensive hair loss and pyoderma. Asymmetrical testicles were observed in two adult males, and in both cases the smaller testis appeared hypoplastic. There was one case of an extensive squamous cell carcinoma and another of a treatable uterine/ cervical infection. Of most interest was the discovery of nine giant pandas with stunted development associated with multiple chronic medical problems. We speculate that a systemic illness during critical growth and developmental stages may be occurring, which results in malnutrition, enamel dysplasia, stunted growth and ultimately failed reproduction. Determining the cause of this syndrome is one of the highest priorities for the future of a healthy, reproductively sound giant panda population in captivity. The order of action should first focus on better defining the syndrome in the context of risk factors, case definition and differential diagnoses. This should be followed by applying new knowledge and the best contemporary diagnostic modalities to address this severe anomaly. Strategic directions for future study should include improved parasite monitoring, serosurveys for understanding the prevalence of infectious diseases, advances in molecular diagnostics for detecting specific pathogens and endoscopic evaluation of the gastrointestinal tract of affected versus unaffected individuals. The Biomedical Survey of the giant panda revealed health, reproductive and developmental findings which were significant for today or could be sentinels for emerging trends in this valuable ex situ collection. Therefore, it makes sense to continue monitoring this population actively to determine if adverse observations (severe ascites, infections, Stunted Development Syndrome) are becoming less common or if new medical challenges are materialising. Furthermore, the examination of all available animals is essential as the sporadic testing of only the occasional individual will fail to reveal important population tendencies. In short, without a continued emphasis on biomedically surveying the giant panda population in (and outside) China, the present effort becomes only a 'snapshot' of population status at one time in history, quickly becoming outdated and of little use to genetic management. Therefore, this type of intensive monitoring of this important flagship species is vital. A key to effectively managing and using all the information collected during the Biomedical Survey (and thereafter) is the availability of a centralised database. Such 'information repositories' are already available (e.g. a software program known as MedARKS; International Species Information System, Minneapolis, MN) and need to be developed cooperatively by all giant panda holders (within and outside China). A biomedical database would allow managers to recover medical information quickly to determine if an animal is healthy or to select a potential therapeutic treatment. These information systems also allow identifying or tracking trends in population health and reproductive status to permit changing management more effectively to prevent a problem or to take advantage of improvements occurring at another facility. Finally, such databases allow the scientific study and interpretation of data to improve our overall understanding of a species. As explained in Chapter 22, one of the most productive outcomes of the Biomedical Survey was realising the need for and value of information sharing among the partners. In terms of improved management of the ex situ giant panda population, there continues to be a strong desire for extensive capacity development in the biomedical sciences, especially in veterinary medicine. One priority in particular is the need for training in disease identification and management. Certainly, the disease issues recognized and discussed in this chapter and later by Loeffler et al. (in Chapter 16) reflect the complexity and dynamism of the situation in the extant giant panda population in China. As illustrated in Chapter 22, highly successful workshops have already been conducted in veterinary diagnostics and pathology. But these efforts are only a modest beginning in addressing the extensive need for training that will allow diseases to be effectively diagnosed, managed and then eliminated in captive populations within China. Thus, although listed as the 'last' priority in this section, the need for capacity building can by no means be delayed. For those willing to provide training within China, such efforts are absolutely essential to achieving the targeted goal of developing a 'self-sustaining captive population of giant pandas within China' (see Chapter 2).